From ZigBee to Z-Wave, plus 802.n options, wireless communications choices seem limitless. Projected market demand for 5G and other future communications applications is prompting the development of different wireless technologies. Some are in direct competition with each other, and there are overlapping frequencies. Other standards have moved from initial engineering groups, such as IEEE, to special trade organizations, and some have changed names. Extended range operational distances will involve new concepts to achieve increased data rates (usually related to increased frequencies) from personal area networks (PAN) to local area (LAN), metropolitan area (MAN), and other far-reaching mobile networks. Choosing an incorrect operating system may limit equipment capability and user options. The IoT may affect all aspects of life, from wearables, connected cars, and smart homes to industry connected “things,” such as smart businesses (e.g., machine-to-machine [m2m] production) and smart cities (e.g., parking, city lighting, and traffic control). By 2018, over 300 million smartphones globally — or more than one fifth of units sold — are expected to have artificial neural network (ANN) learning capabilities. ANN can permit smartphones to perform functions such as indoor navigation, augmented reality, speech recognition, and learning a user’s daily tasks and preferences, so that virtual assistants like Siri® can be proactive. (Imagine Apple’s Siri calling to suggest what time to set a wake-up alarm based on tomorrow’s first meeting, travel time, traffic, and the weather.) All of this communication will require vastly expanded network protocols involving several different standards and potentially even new hardware (e.g., connectors with various sizes and frequencies) and operating systems. 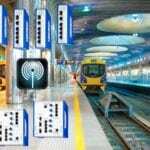 The most widely recognized group of wireless and wired standards results from the work of the IEEE 802 LAN/MAN Standards Committee (LMSC), which covers local and metropolitan area networks. The core IEEE 802.11.n has at least 31 standards and amendments issued through 2016 with others in process. They cover Ethernet, token ring, wireless LAN, bridging, virtual LANs, wireless hot spots, and others. Committee working groups provide support for each area, and most releases are, in effect, stand-alone standards. Historically, 802.11 wireless technology was initiated by a 1985 ruling from the Federal Communications Commission (FCC) that released the “industrial, scientific, and medical” (ISM) radio bands for unlicensed, non-telecom use. The ISM bands were established in 1947 by the U.N.’s International Telecommunication Union (ITU). A wide variety of standards organizations with different corporate memberships are vying for position to dominate short-range wireless data communications. The following is a list of standards beyond the IEEE options. ANT+ is a protocol supported by the ANT+ Alliance Special Interest Group, that features exceptionally low power consumption for short-range, low-data-rate sensor applications, such as wearables, home health monitoring, auto tire pressure, and remote control of household functions (e.g., lights, TV, and appliances). Bluetooth® is named after the Danish king Harold Bluetooth who unified Scandinavia. Bluetooth was conceived as a wireless alternative to cabled RS-232. It was originally defined by IEEE 802.15.1, but specifications are now maintained by the Bluetooth Special Interest Group (SIG). It is widely used to exchange data over short distances from fixed and mobile devices and personal area networks (PANs) using the ISM Band from 2.4 – 2.485GHz. The Bluetooth SIG now has over 30,000 members and offers interoperability plug-and-play to assure functionality. dotdot is a version of ZigBee modified to operate over wired Ethernet connections, unlike regular wireless ZigBee. FirstNet stands for the First Responder Network Authority, which is a public-private partnership for a nationwide wireless broadband system currently being built for all first responders by AT&T under a contract from the Department of Commerce. When completed, it will provide a communications infrastructure for disaster response and recovery, large-scale event management, and day-to-day emergency needs, and will have both short-range and longer-range capabilities. NFC stands for near field (i.e., short range) communications, and its technical standards are sponsored by the NFC Forum Special Interest Group. NFC technology offers applications across every business sector and could potentially revolutionize daily tasks, information transfer, and interactions between people and organizations by involving peer-to-peer transfer, reader-writer mode (e.g., providing access to information on NFC “tags,” such as retail product data), and card emulation, which can enable NFC devices to act like smart cards for retail purchases or site access. The potential significance of NFC is indicated by SIG membership that includes: Broadcom, Google, Intel, MasterCard, NEC, Nokia, NXP Semiconductors, Qualcomm, Samsung, Sony Corporation, and Visa. ISA100a is a standard developed by the International Society of Automation (ISA) for industrial control and automation and managed by The ISA100 Wireless Compliance Institute. Standardized internationally as IEC 62734, it supports production of consumer and commercial products with cyber security (e.g., for m2m tasking), feedback quality control, and other features. Z-Wave, which was developed in 2005, uses a Z-Wave gateway that serves as both the Z-Wave hub controller and the portal to the outside to enable the automation and remote control of HVAC equipment, security systems, home cinemas, window coverings, garage doors, and home entry, among other applications, via Internet-connected devices. Currently, more than 35 million compatible products have been sold. ZigBee. This technology reportedly got its name because the path of a message in a network can be envisioned like a bee zig-zagging in flight. It is intended to be simpler and lower cost than other wireless personal area networks (WPANs), such as Bluetooth or Wi-Fi. Applications include: wireless light switches, electrical meters with in-home-displays, traffic management systems, and other consumer and industrial equipment that requires short-range, low-rate wireless data transfer over distances up to 100m line-of-sight. ZigBee has a data rate of 250kB/s for intermittent data transmissions from a sensor or input device. The projected growth in IoT may be unsustainable under current architectural approaches. Many IoT deployments face challenges related to latency, network bandwidth, reliability, and security that cannot be addressed in cloud-only models. The next developments are for “Fog Computing,” which adds a hierarchy of elements between the cloud and endpoint devices, as well as between devices and gateways. Another approach involves edge computing, which refers to data handling at a level just above the device using it, such as in memory between work-in-process operations. The wireless industry is continually making progress to accommodate the massive data generated by forthcoming 5G telecommunications, IoT, and all of the short-range consumer and commercial data expected to be produced by tomorrow’s wireless communications. Market Development Manager, RF/Microwave at Bishop & Associates Inc.
David Shaff has more than 40 years in the interconnect industry, holding positions in engineering, sales, manufacturing, and distribution, including distribution supplier manager and general manager. He participates in a number of standards committees, including ANSI, PCMCIA, and SAE. Shaff earned his engineering degree from the Georgia Institute of Technology, followed by an MIBA and additional post-graduate studies. Product successes range from DC to 110GHz, downhole/seismic to space, while working with ITT, JAE Electronics (NEC), SV Microwave, AVNET, and Southwest Microwave. How Will Connectors Deliver Terabit Speeds?